I worked on pre-production for an unreleased game called Transverse. In the early stages I was responsible for technology R&D, investigating, documenting, and teaching new software and art workflows such as Unreal 4's layered materials, material instancing, and Physically Based Lighting to the other artists, as well as setting up the art pipeline & folder structure. Throughout the creation of the initial marketing video, I managed the outsourced environment artists, lit the worlds, and completed art polish on most assets. I modeled the cockpit of the epee fighter, helped to implement advanced cinematic camera features in our most important shots, and generally assisted the art director and other artists. I lit the on-planet takeoff sequence which featured these floating platforms, two suns, and multiple planets in the sky. I also did some world building and supplemental modeling for this scene. I lit the space station and all of the space scenes throughout the trailer. I was also the art outsourcing manager, where I provided feedback, set up the pipeline, and oversaw the modeling and texturing of the station and its parts. Additionally I created the initial skybox shader system. 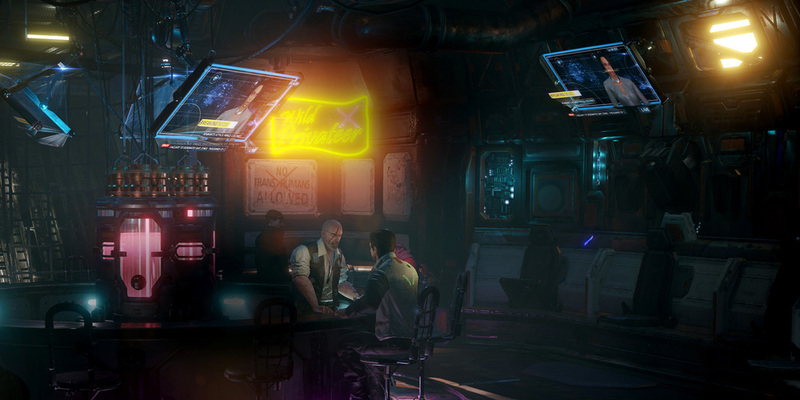 I lit the interior bar scene which featured many neon lights, TVs, emergency ship lighting, and holes/windows to the outside desert. I modeled the cockpit for the Epee (human) fighters. The cockpit is seen from a pilots point of view, as well as from the outside of the canopy looking inward, so the majority of the detail went to the console and behind the pilot's seat. Most small details were to be added through nDo during the texturing process, however due to time constraints that was never completed.